It’s really not all that unusual today to see a professional athlete endorse a product. But it’s incredibly rare that nearly 20 years after an advertising campaign, the commercial is still as beloved now as it was back then. For this week’s Flashback Friday, we take a look back at Roberto Alomar’s famous McCain punch commercial. By now, I’m sure many of you have seen this video on Youtube numerous times, but here’s a refresher just in case. Surprisingly, there’s hardly any dirt on this commercial or the McCain punch campaign whatsoever. If it weren’t for Retrontario posting the video, there would likely be no such records of this commercial ever taking place. Judging by the timestamp on the video above, the commercial was released in 1994, but something tells me the Catch the Taste spot may have run prior to that. Again, this is all just me trying to remember what happened nearly 20 years ago. What I know for certain is we used to drink McCain punch in my household like it was water. One of my favourite things to do was to eat the frozen concentrate straight from the can with a spoon (especially the watermelon flavour). 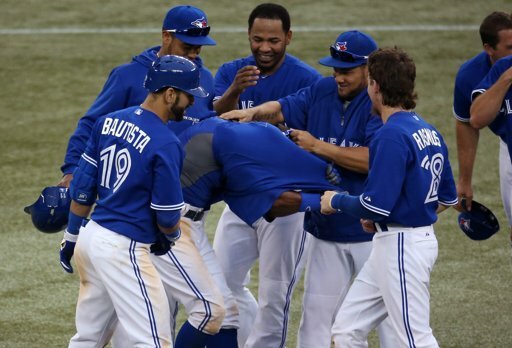 Everyone can recite the catchy hook at the end of the commercial, but I’m curious what ever happened of the “Win a Day with Alomar and the Blue Jays” Sweepstakes. Apparently all the details are in the Jr. Jays Digest. 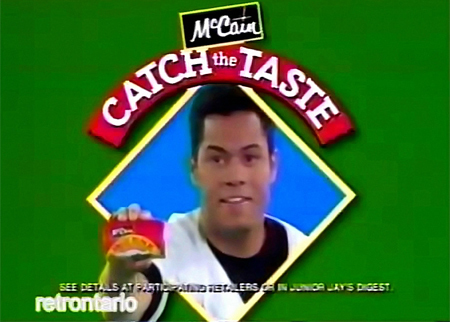 As far as I know, the McCain punch line is sadly no longer available in stores, and to my recollection that was the only McCain punch TV commercial featuring Roberto Alomar. Even nearly 20 years later, it’s still as great as I remember. Fast forward to today, and you can purchase official “Catch Da Taste” t-shirts from Roberto Alomar’s website at $24.99 a pop. Now you can catch the taste every day!